Standing at the critical juncture between traditional romance and early novelistic realism, Zayde is both the swan song of a literary tradition nearly two thousand years old and a harbinger of the modern psychological novel. 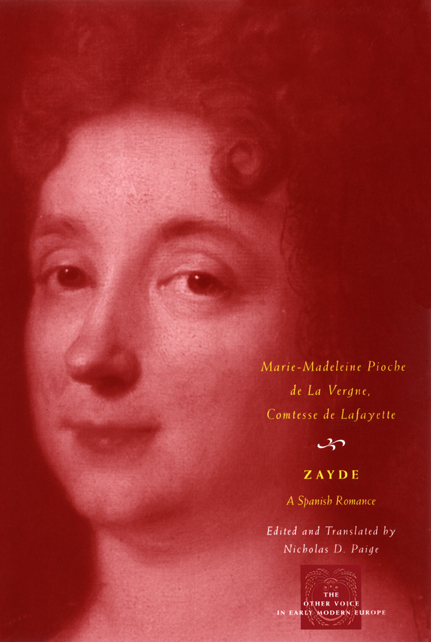 Zayde unfolds during the long medieval struggle between Christians and Muslims for control of the Iberian Peninsula; Madame de Lafayette (1634-93) takes the reader on a Mediterranean tour typical of classical and seventeenth-century romances—from Catalonia to Cyprus and back again—with battles, prophecies, and shipwrecks dotting the crisscrossed paths of the book’s noble lovers. But where romance was long and episodic, Zayde possesses a magisterial architecture of suspense. Chaste and faithful heroines and heroes are replaced here by characters who are consumed by jealousy and unable to love happily. And, unlike in traditional romance, the reader is no longer simply expected to admire deeds of bravery and virtue, but instead is caught up in intense first-person testimony on the psychology of desire. Unavailable in English for more than two centuries, Zayde reemerges here in Nicholas Paige’s accessible and vibrant translation as a worthy representative of a once popular genre and will be welcomed by readers of French literature and students of the European novelistic tradition. "Paige’s lively introduction takes the reader into the rapidly evolving world of seventeenth-century French literary prose. . . . The superb translation makes accessible and enjoyable Lafayette’s sometimes complex syntax and the idiosyncrasies of her prose." "With its thorough introduction, clear and informative footnotes, and extensive bibliography, Paige’s Zayde will bring a fresh view of Lafayette’s work to the English public." "This is a reader-friendly text, highly recommended for a diverse public, including those interested in the early modern novel or in literature by women." "This is a work that can be used in a variety of classroom settings, such as courses on romance, the development of the novel, print culture, courses in women’s studies, and on early conceptions of ’orientalism’. . . . Paige’s English edition is thorough, painstakingly produced, accurate, nuanced, and elegant. It is quite simply a model translation of a difficult text. He is to be congratulated for making Lafayette’s complex prose so readable and clear. It is truly a pleasure to read this translation."